Elements Applied: Plant’s bark and leaves are commonly used in herbal medicine. Used For: The remedy is used to treat diarrhea, induce vomiting, and decrease blood circulation. It is also valued for its bitter taste. Fresh plant bark is specifically applied to induce vomiting. If you’re going to employ other properties of this plant, use dry bark extract. Bark is effectively applied in form of decoction as a gargle for pharyngitis and sore throat. The leaves and the bark are used in powder to stimulate the digestive system, treat diarrhea and reduce bleeding by lowering blood circulation. For the above mentioned aims it’s applied both topically and orally. When boiled up in vinegar the bark is topically applied for skin conditions like scabs and scabies. It is additionally applied for teeth cleaning. 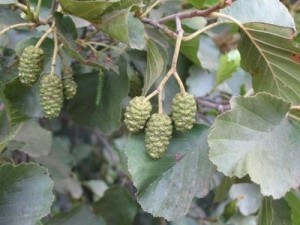 Additional Info: Black Alder is a tree which can reach up to 80 feet in height, and is found in North America, North Africa, Asia, and Europe. It prefers cool atmosphere and is commonly found in moist areas, like damps, river and stream banks. The leaves are round-shaped and alternately located. The flowers are male and female. The female ones are of red-color and produce cones which include seeds. Preparation and Intake: To make a decoction, take 1 teaspoon of leaf or bark extract for a cup of water, and boil it up. Taken internally in a quantity of 1-2 cups per day, a swallow at a time. In form of tincture the plant is applied in a quantity of a half to a teaspoon per day. In form of powder the common dose is 8-12 grains.